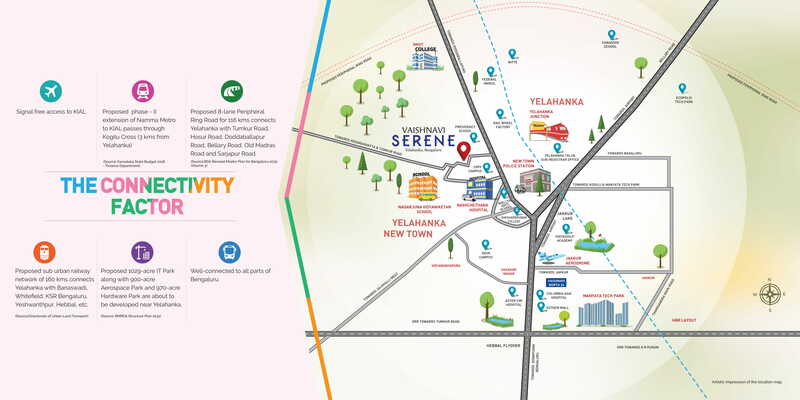 Vaishnavi Serene is coming up in serene locales of Yelahanka, one of the prominent locales of North Bangalore. Yelahanka is known for its serenity and ambience. The locality has two major parts – the Yelahanka Old Town and Yelahanka New Town. Both Old Town and New Town compass a blend of the old and new world charm of the locality. While Old Town has established commercial markets and antiquated houses, New Town is a prime residential locality, filled with new residential developments, thus bringing about the right balance to this beautiful locality. The bird sanctuary Puttenahalli Lake and Yelahanka Kere are the major lakes surrounding the locality. Yelahanka is positioned amidst extensive green covers and has a number of lakes within its enclosure. The locality’s proximity to up-growing locale of Hebbal and its easy accessibility to International Airport have immensely contributed to the continued expansion and consolidation of Yelahanka. Proposed sub-urban railway network of 160 Kms is prospected to connect Yelahanka with Banaswadi, Whitefield, Yeshwanthpur and Hebbal. Proposed 1029 acre IT Park along with 900acre Aerospace Park and Hardware Park are located at short drive distances from Yelahanka. Yelahanka is brimming with real-estate activities and has seen an uptrend in the demand for commercial and residential market. There are residential communities in this locality being developed by key builders of the market like Vaishnavi Groups, Prestige, Sobha Developers, Godrej Properties, Puravankara, Salarpuria Sattva Groups, Provident Groups, Rohan Builders, Shriram Developers and Brigade Groups among others. The buying rates as defined by the market research data is as follows: Price range per square feet – Rs. 1,052 - 12,436 / sq ft and has an average price of Rs. 9,287.1 / sq ft.